We offer 20 apps that will help you save money. Some of them offer simple savings, such as helping you find a place to park your car in a busy city, and others offer more direct savings, such as apps that help you find a cheaper hotel room at short notice. Here are 20 apps that will save you lots of money. When you sign up to Goodbudget, you will be able to budget your spending. Goodbudget will monitor what comes into your account by tracking your linked bank account. Plus, you may access your Goodbudget account on your mobile device and via your desktop computer, (you can only install onto two devices at a time). It will be able to see how much you spend on your shopping, bills, children’s weekly allowance, transport, and so forth. You may use their free plan, or you may choose the Plus account at $6 per month plan. There is also a $50 year payment option where you pay for your account annual rather than monthly. When you sign up for the free account, you get one account, plus one year of history, 10 Regular Envelopes, and 10 additional Envelopes. Plus, you are able to use your account on two devices, and there is as much community support as you need. With the Plus plan, you will be entitled to unlimited regular envelopes and customised envelopes. You may also have five devices connected, and you are given e-mail support and may add unlimited bank accounts. The Wi-Fi Finder app allows you to find Wi-Fi locations in your area that do not charge users. If you go on vacation, you can use the app to find places that offer free internet so that you do not spend a fortune on data charges. It allows you to find free public Wi-Fi spots, and as odd as it sounds, you do not need to use your internet data to find free internet spots. In other words, you are able to turn off your internet and use this app offline to find you locations that are offering free internet. The app will make finding free Wi-Fi easy and it is free to use with your apple phone. You are also able to access the internet by searching for hotspots that have free passwords or no passwords. This app may help to save you a lot of money by helping to avoid extra changes being added to your data plan. Wi-Fi Finder finds hotspots fast for you, and if you want to save your favourite hotspots then you are able to do so as it is within the app. BigWords is a fantastic app for students who are on a tight budget. This app is fab for students who have trouble sometimes buying textbooks for high school, college or uni. BigWords is an app where you can sell things like clothes, books, DVDs that you no longer need or want. You can even rent books and textbooks from BigWords for a cheap price. You may buy the books, and then if you want, you can re-sell them back to BigWords once you have finished with them. With BigWords, you can save up to 90% when compared with buying books new from retail locations. You are also able to find and use promo codes, discounts, and online coupons. Grab a few discount codes from BigWords, and then you can hop on to websites such as BetterWorld.com, BooksAMillion.com to use your discounts, or you may visit up to 30,000 stores that accept the codes that BigWords has to offer. It is free to sign up with BigWords, it wont take more that 5 minutes, and it is free to use. BerryCart is the best way to save money and still buy healthy foods without braking the bank. The app will save you a lot of money on your grocery’s as it will find the best gluten-free, non-GMO and/or organic foods that is available in and around your area. Such varieties of food are often overpriced, and with BerryCart you are able to find the least-marked-up prices. The app also offers a range of different deals. For example, a recent deal was: If you find an item that is cheaper in a different store, then they BerryCart may help pay the difference. BerryCart works with over 10,000 locations. The most popular stores that are listed on BerryCart are Kroger, Safeway and Walmart. The app locates the shops in your area and tells you which are advertising the lowest prices right now. It doesn’t cover smaller or independent stores that do not have a website because BerryCart pulls its prices from websites. The app mostly features discount codes, deals and offers on food and groceries, but they occasionally have a few non-food discount codes too. The kindle app is a ebook app where you are to purchase books either by buying them from the online library or by getting the ones that are available for free. You are able to read text documents that were not bought from Amazon, in the same way that you can read e-books from Amazon on your PC without having the Kindle app installed. You can sample a great many ebooks for free. There are not just books to choose from, you can buy or sample magazines too. With access to your account library within the Kindle app, you will be able to read and re-read your books, or search online for new books to add to your collection. When purchasing the book you will need to give the app your bank details, so do a little research beforehand to make sure the system is still safe (it is safe at the time of writing, but who knows what tomorrow will bring). If English is not your fist language, there are settings to choose from where you can pick from French, Italian, Japanese, German, Portuguese, Simplified Chinese, Spanish or Dutch. The app may help save you time because it gives you a categorized place to store your books, you wont have to pay much and wont have to carry lots of books everywhere. The only problem with the app is that is does seem to crash sometimes when it has been in use for a while. The Rakuten Slice app is the best app for tracking your favourite shops online. When you purchase any item, Slice will then be able to track that same item to see if the price drops at anytime once your have paid for it. The Rakuten Slice app will then notify you that the item’s price has dropped so then you will be able to go back and get a refund and buy it cheaper elsewhere. It is even handier if the shop you started with has a beat-the-lowest-price policy. To keep your family and yourself safe, Rakuten Slice has set up a section within the app that will let you know if anything you have bought has been recalled by the CPSC. In which case, you will receive an email straight away alerting you of this. When buying your products for work or home, you may require a receipt, and that is where the “Access Receipts” function comes in. It is easy to use, you won’t need to waste any paper on receipts, and you will always know where you receipts are if you ever need them. The Raise app is an exchanging-gift-cards app. When you get given a Ebay giftcard, but you figure you will never shop there, the Raise app will allow you to swap the gift card for a different one. Sign up for an account, and you will be able to conduct the swap within the app. Alternatively, you can choose to choose to have the money instead, but you do not get the full cash value of your card. Within Raise there are 30 gift cards that Raise excepts. It is free to join, and you get a 1-year money-back guarantee with every card you buy. You will need a credit card to open and use your account. You cannot sign up with a debit or prepaid card. If you choose to use Raise app, you may refer a friend and get $5 to spend on yourself. The app is easy to use, all you will need to do is sign up, create a password, add your credit card details, and once you have done that you can login and start selling or buying gift cards. Happy Hour Finder is a search-and-locate app that finds you the pubs and bars that are offering happy hour bargains. This app is for you if you love to go out drinking, but hate to spend so much on the drinks. It will even work when you go on vacation overseas, so you wont be paying so much on drinks when abroad. Happy Hour Finder works when connected to Wi-Fi or when connected to mobile internet. You have to enter your location into the app, after which the app generates a list of bars that are doing happy hour in your area. You will be able to save your favourite pubs that do happy hour, so that you may remind yourself of them at a later date. The app also has deals and offers relating to Uber. For example, there was a deal where you could earn Uber credits that counted towards a free ride. The app doesn’t have an age restriction, which is fair enough because there is nothing adult about the app. RepairPal is a great app saving money when your car is broken. It is handy when shopping around for a mechanic, and it may also help you find a mechanic fast without it costing you a small fortue. RepairPal will find you a mechanic shop that is in your area. There are also some mechanics who offer to give you an estimate online. You may use the app to get estimates from different mechanics, so that you may compare them and see that you get a fair price before you even call the shop. The app is easy to use, you simply select your type of car, select what service you would like, enter your zip code, and then tap the “get estimate” button. The app is free, but there are adverts on it. You can sign up via the app, or you can connect your Facebook account. It is probably better if you create an account if you prefer to keep your Facebook profile private. If you do connect via Facebook, then you can share your experience with your friends through the RepairPal app. This may be handy if you find a good mechanic, or if you are looking for advice from other people about the mechanic you chose. Sworkit is an app that gives you working out ideas, puts you on a schedule plan, and gives you a fitness goal you can work with. In short, it will save you a bundle because you can use it instead of hiring a personal trainer. It has over 30,000 workouts to choose from per day, and you get to use the app for 30 days for free. You are able to sync all your workouts to the other app called Apple Health or MyFitnessPal. The app allows you to opt for a yearly subscription at $79.99, or a quarterly subscription at $29.99. When you buy into a subscription, make sure you turn off the auto-renew feature unless you actually want it to auto-renew. Start with the 30-day trial and make sure it doesn’t roll over into a paid contract automatically. If you are happy with the service, then give it a go on a quarterly or yearly basis. The BestParking app will locate the best and cheapest parking locations near you, all you need to do is select a City or an Airport and the app will do the rest. You can access this app though via your Iphone, Ipad, Andriod or Black Berry 10. The BestParking service uses and is compatible with Bing maps, Parrot ASTEROID, deCarta, MAGELLAN and GARMIN and many more. The BestParking app gives you will have full coverage of 115 Airports in North America and parking locations in 100 cities. You will be notified if there is valet parking, or the parking area’s machine only takes cash. This app will help you save cash in two way. Firstly, it may help you avoid having to drive around looking for parking spaces. Secondly, you are able to see a number of parking areas in your location, which means you will not be forced to park in an overly expensive area, (you can find a cheaper place). Military Cost Cutters is a great app for people who were in the military and it allows veterans to find businesses that offer discounts for the service men and women.You will first need to sign up using your laptop, computer or tablet. Then you download the app onto your phone which will only take a minute or two. You are able to research discounts by your zip-code, country or by the use of your GPS. When you pay a visit to the business you found, make sure you take your Veteran ID. If you don’t have a military ID, but you are/were part of the military, then contact Military Cost Cutters and they may be able to issue you with a suitable ID that shows you were in, or are in, the military. The scan code function is handy because you receive a promos from the business, and you are able to show the business your promotional offer by having them scan a code on your phone. The GameFly app is great if you love buy games, but you feel that it costs to much sometimes. Within the app you can buy, sell, or rent old-and-new games for $15 a month. You will be able to buy games with the coupons you earn and that will save you some money to offset $15 a month. GameFly has plenty of the old games that you can buy, which is similar in some respects to the old game library known as www.Gog.com. If you buy a game that is truly defective, maybe with bugs or other problems, then ask for a refund of your money or your coupons. The app has information on Xbox One, PS4, Xbox 360, PS3, Wii U, PS Vita, and 3DS games, which makes it a great resource when you are shopping around for games. The app also allows you to rent and buy DVDs and BluRays. The app will save you money if you tend to buy older games for your games consoles, but it may not be worth your time or money if you are not a frequent gamer. Campus Special is a money saving app that will help to reduce how much money students pay on food when they live on campus. The app helps you local restaurants where students get a discount. It also helps you find the best deals that are available in your areas for students. Some of the eateries and fast food shops will deliver to you, which will save you from having to pick up the food yourself. The app helps allows you to order food fast from over 15,000 restaurants in 250 US cities. You may also earn rewards that may be redeemed at the restaurants you frequent the most. You may place food order with the click of a button by signing up with the app and making your order. You can pay by adding your payment details, or you can pay in cash when the delivery driver arrives. The Hotel Tonight app will give you deals and discounts on national (and a few international) hotels. You enter your desired location and the app will see if the local hotels have rooms at an overly cheap or discounted rate. If you need a hotel on short notice, then the Hotel Tonight app may be just what you need. Plus, it is free to use. The app has a family sharing support where you can have up to six family members registered on the app. If you are a regular user of the app and you have a few hotels added into your favourites list, then booking a hotel room will take less than a minute. This app is best used for spontaneous trips or trips where little planning has been undertaken. It is the app you turn to when you are in a town and you need a hotel before nightfall. Santa’s Bag app is an app that will keep track of your gift spending. Keep track of your spending, be it for Ramadan, Christmas, Birthdays or other special occasions. The app will help to keep your spending in check, and will keep a list of how much you are spending on each person on that list. By keeping track of what you spend on each person, you are able to ensure that you spend the same amount on each person every time. The app has many hand picked gift ideas to choose from, many of which are listed on the RedGiftRoad.com website. It has a backup system that you may access via Dropbox. It will store your budget safely away, but it is only available on the Santa’s Bag Pro version. The Santa’s Bag app it is great for keeping and maintaining a budget. It helps you keep track of your gifts and what you have bought for your friends and family. It even sends messages to remind you that you have forgot to get something from your wish-list. The app will even tell you where the item you want is located. If you buy from certain websites, then the app will also give you delivery information too. The only thing that is annoying is that they named the app Santa’s Bag when they encourage you to use the app all year round. The Goldstar app offers you tickets, and sometimes you can get them at a discount. When you are shopping around for concert tickets, you should check out this app to see if there are any good deals or discounts on your desired event. You are able to find tickets for concerts, comedy shows, sporting events, musicals and much more. New events are added daily, and you can set alerts to inform you when your favourite events are taking place and alerts for when there are tickets available. The app is free to use, but they do make money on your purchases. They are able to offer lower prices because the tickets you buy have limitations on them. If you can live with the limitations (in the small print), then you may save money with this app. The Hopper app helps you find the lowest airfares with their price-prediction feature. Some people have saved up to 40% when using the Hopper app. You may book your flight directly in the app, and you will receive notifications informing you when your flight is due. Hopper is free to use, easy to understand, and it has a step-by-step video that shows you how to work the app. The Hopper app will inform you if its predictive feature thinks you should wait for a cheaper flight. In other words, if it thinks the flight it is showing you is still too expensive, then it will suggest that you wait for a better price to come along. The app allows you to find prices for round trips and for one-way fight. This is the weakest of all the apps to save you money, but there is an intern in our office that claims it funds his Starbucks visits. Viggle is an app that rewards you for watching TV shows just by checking into show through the app. You will earn point in which you get to use in Barnes & Noble, Starbucks and other great brands, you get to earn extra Perk points by testing you IQ and playing games based on the TV shows you watch. The amount you earn is paltry at best. It is simply a way of doing a bunch of stuff with the hopes of getting purchase points with named-brand companies. Do not expect to earn any sort of real money with this app (even if the app developers tell you differently). When using the app you need to have your Wi-Fi connected otherwise it will soak up your mobile data. You will be able to use your perk points to be entered into the sweepstakes competitions where you may win gift cards or other fun prizes. If you use Viggle daily, you could get over 15 perk points just by logging into the app. The app is a nice distraction that may yield a few purchase points for brand named companies, but all the ads make earning the points difficult. 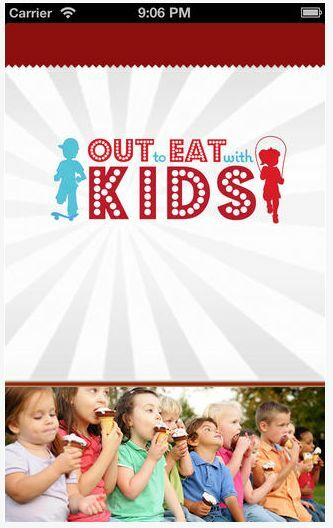 Out To Eat With Kids app makes going out for a meal with your children a little less stressful, plus you will save a little money. The app helps you to find establishments where children eat free if they are 12 months to 5 years of age. The app is simple to use, and the app may help you find healthier eating establishments as well as fast-food places. You are able to create your own favourite restaurant list, and you may plan a vacation away by searching the nationwide database for cheaper places to eat. Plus, you may share all your favourite or the poor-quality eateries though Facebook, Twitter and Instagram. You can access the kids specials and order before you get to the restaurant in some cases. This is handy as it helps to guard against your children becoming fussy while waiting for food. The app includes restaurant details too, such as its phone number, a map to the establishment, and the full address and zip code so you can find the location easier. After a varied career in different industries from the hospitality industry to the financial consultancy industry, Ash now spends his days working as a professional writer. TransferWise vs. CurrencyFair: Which is Better?